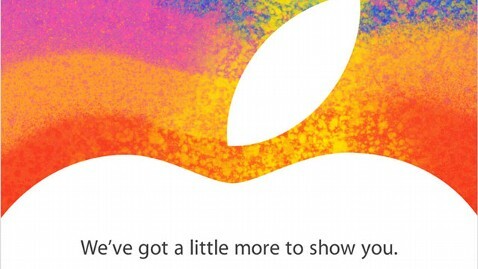 SAN JOSE, Calif. - Apple plans to show us a "little more" Tuesday. Will it be an iPad Mini? A smaller, 13-inch version of the MacBook Pro with retina display? The regular iPad with the new lighting dock connector? All those are rumored, but come Tuesday, at 10:00 a.m. PT/ 1:00 p.m. ET , we will have all the answers in our live blog below. In the meantime, you can check out some of our previous articles on the iPad Mini and what Apple might have in store. The Cliff Notes version? The iPad Mini is rumored to have a 7.85-inch screen, 3G and 4G cellular connectivity, and run iOS 6, the operating system Apple released last month for the iPad, iPhone and iPod Touch. Apple is also expected to announce some Mac products, including a higher resolution 13-inch MacBook Pro (here's our review of the 15-inch version). ABC News will be at the California Theater in San Jose Tuesday, bringing you the minute-by-minute updates. The updates will appear in the module below at the time of the event. You can also sign up for an e-mail reminder below. We will see you Tuesday!